One advantage of Grant’s work being unpredictable is that occasionally he has to go to Perth, the capital city of Western Australia. Last week he had to make a four day trip and I was fortunate enough to be able to get a ticket with frequent flyer points. This gave us an opportunity to fly south on the Sunday and arrive at lunchtime. It is easy to get to the city on a public bus and then get onto a train on the Joondalup line going north to go the few kilometres to Herdsman Lake. This would be our only opportunity to go birding together in Perth and whilst many people from the country head to the city to go shopping that was the last thing on our mind! Our last visit to Herdsman Lake was in winter in June 2011 and last Sunday was a beautiful hot summer day and most people appeared to be inside as we spent several hours circumnavigating the lake system. 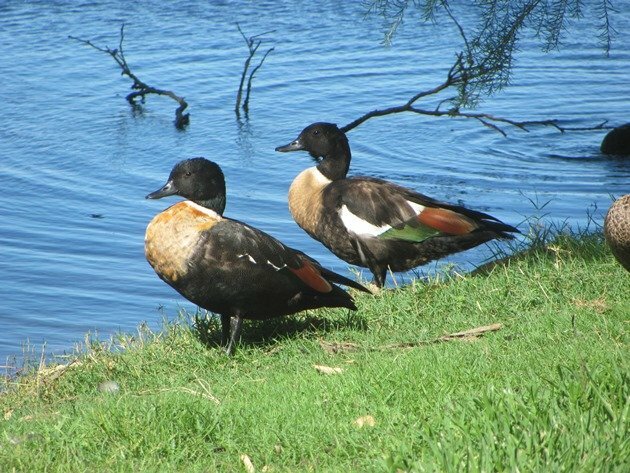 It is an excellent place to find a huge variety of ducks and many of these ducks we would not see in Broome during the year, so a real incentive to spend as much time as possible walking and birding around the lake. The new ducks that we added to our year list were Blue-billed Ducks, Australian Shelducks, Musk Ducks, Australian Shovelers, Australian Wood Duck and Freckled Ducks. There were also plentiful numbers of Pink-eared Ducks, Grey Teal, Pacific Black Ducks and Hardheads. 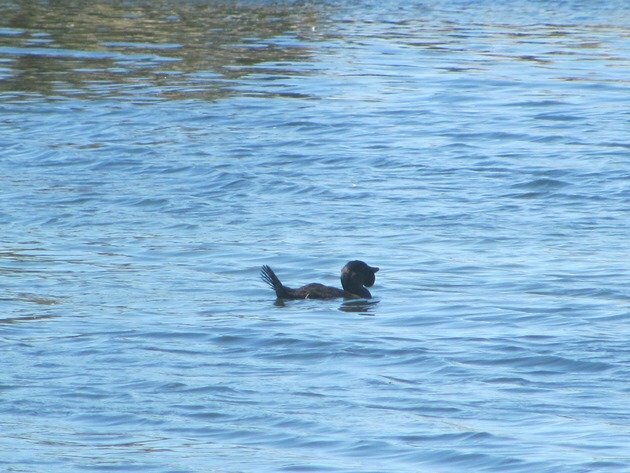 The Blue-billed Ducks and the Musk Ducks have an erect tail and the male Musk Duck has a rather odd looking lobe underneath its bill. There always appears to be a Swamp Harrier swooping over the reed beds on our irregular visits and this time was no different. 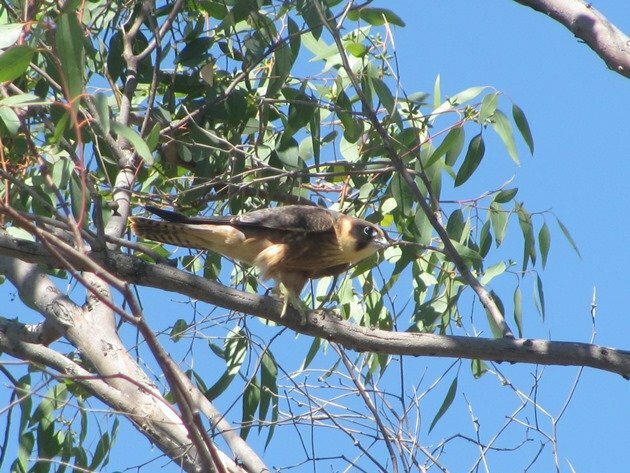 Another raptor present on this visit was the Australian Hobby and we observed three of them on the south side of the lake. 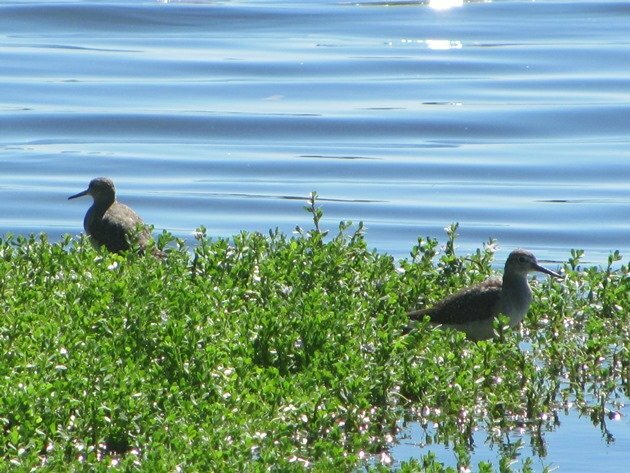 There were three Wood Sandpipers present on this visit, due to the fact that it is summer here and they reside here during the summer months and then head north to breed in coming months. They were the least concerned by any cyclists on the footpath close to where they were feeding. 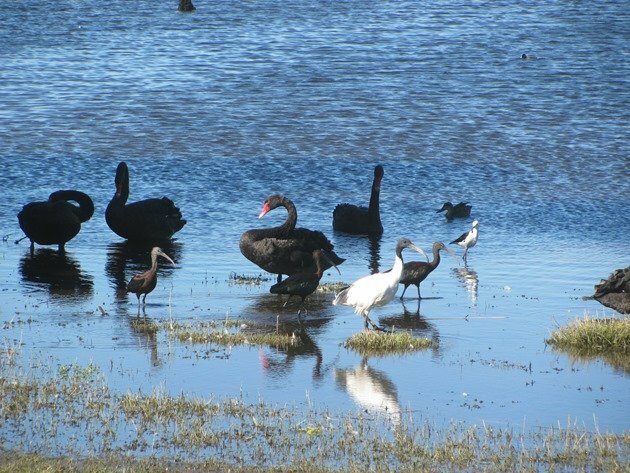 Herdsman Lake is an excellent site to see the Black Swan, which is the Western Australian bird emblem. The birds were mostly adults at this time of year, but there was one cygnet close to a parent on the grass as we followed the trails around. These are the same birds that are known to surf in Broome! 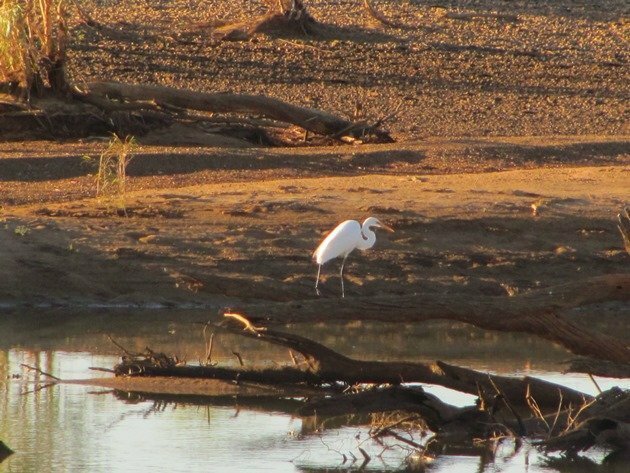 There were several Great Egrets close to the Wildlife Centre and we also observed our first Yellow-billed Spoonbill for the year close by. There were good numbers of Purple Swamphens, Dusky Moorhens and Eurasian Coot on this visit, though the grass was a lot dryer than when we visited in winter. 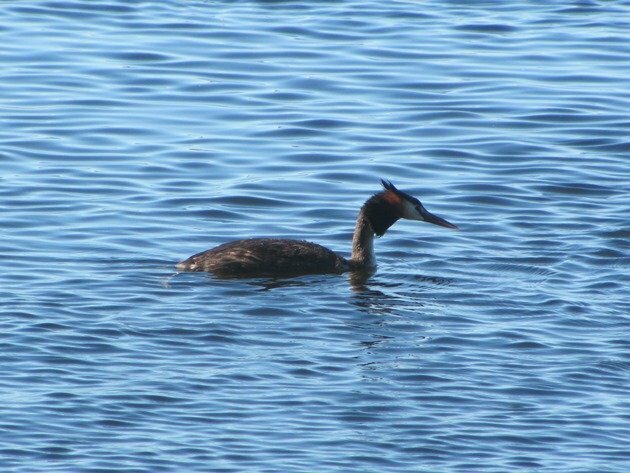 There were numerous Great Crested Grebes out on the water and that was a grebe we had not got on our year list to date. In fact the last time we saw them was at the magnificent bird watching site- Lake Bindegolly National Park-in Queensland almost a year ago. 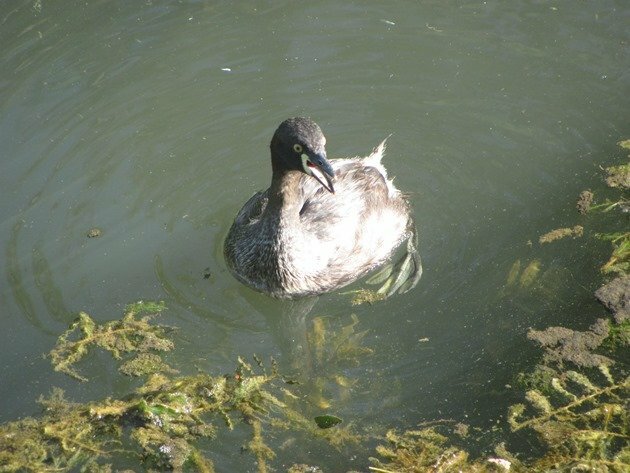 As we followed a small trail on the west of Herdsman Lake we were suddenly aware of an Australasian Grebe sitting rather still on some floating foliage. As we approached it kicked up some leaf matter and hopped off the floating plants. We could just see two eggs on the floating nest and the bird had a fair bit to say to us as we passed by. 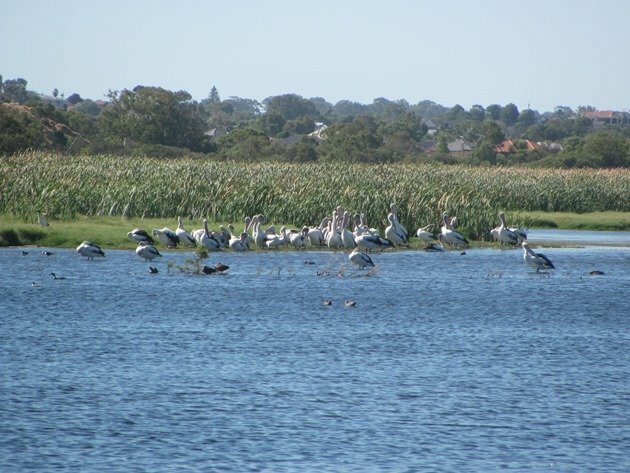 A bit further around to the west side of the lake system there is an Australian Pelican roost and all around the banks there are ducks, ibis and waterbirds. The flowering trees are worth stopping to check and there were Western Wattlebirds, Red Wattlebirds, New Holland Honeyeaters, Silver-eyes and at least one hundred Willie Wagtails around the lake system. This has to be the hotspot for Willie Wagtails in Perth! We observed over 60 bird species during our stroll around Herdsman Lake and 27 of these were new onto our year list. 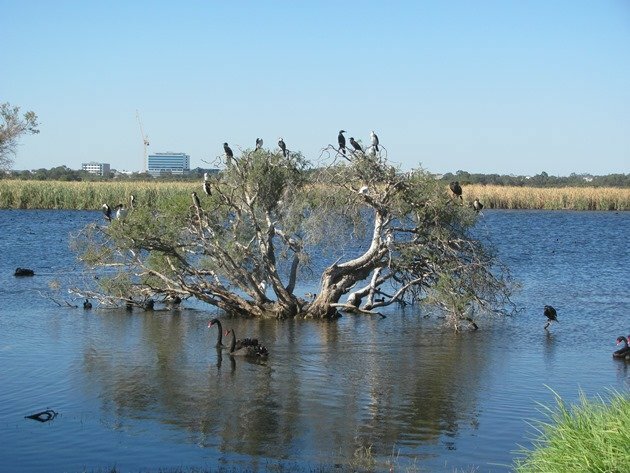 Some we would see later during the year in Broome, but this is one of the most productive birding sites that we know of in Perth and so close to the city as well. Since our last visit there is now an updated website that is worth exploring. There is also now a website called Atlas of Living Australia where you can find out everything about an area. It covers all plants and animals and anything else you may come across and be interested in. 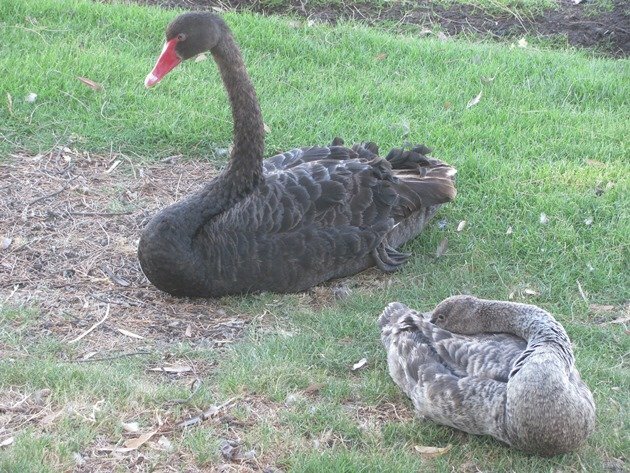 You have the weirdest ducks down under! Oh my, summer! Thanks for the tour of Herdsman Lake, specially loved the grebes.